Selene is thrust into the aftermath of Caedmon pack rivalry when determination to help her friend, Tamara, leads her to the foothills of the Virginia mountains. Her kindheartedness gets her into deep trouble when she finds herself kidnapped and held against her will. She’s thrown behind bars with Nick, who has also been captured. Her fellow cellmate saves her from a sentence worse than death but now she is at his mercy…and Nick is no ordinary man. Under the façade of his commitment to protect her from evil hides a secret that shatters her faith in him. Wolf shifter Nick knew his life would be forever changed when Alpha Devin Caedmon honors him by inducting him onto the Caedmon Council. With this responsibility, he’s introduced to a web of pack politics and subject to threats. In the midst of being captured by a Pack enemy, he meets a tempting brazen beauty. Selene is not just any woman, and the wolf inside reminds Nick of this fact every time she’s in his presence. She awakens raging passion within him, and he desires her like no other. But he’s had the misfortune of being burned before. He must learn to forget how cunning a woman can be and decide if he can trust Selene with his heart. True love awaits in the path of danger, but will Selene and Nick let the chaos destroy their bond? 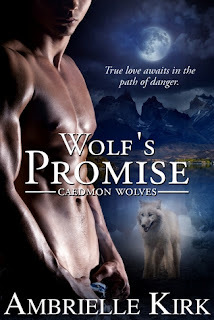 Wolf's Promise is Book Two of the Caedmon Wolves series. Books One through Six are also available now. Selene and Nick meet after they're both captured and held by a wolf shifter. The man who is holding them wants something nefarious from Selene in exchange for saving her after she crashed her car. Nick saves her from that terrible fate but she fears he's not the savior she first thought him to be. Once they make it away from the wolves that captured them they find themselves unable to go their separate ways like they think they should. Selene still wants to find the woman that she set out to find and make sure she's safe and Nick has to let his leader know what has happened and who did it. It was interesting to find out where the missing woman was and who she was. It was also really interesting to watch Nick and Selene get to know one another. Selene was really scared when she found out that Nick was a wolf shifter but she gets over it pretty quickly when he saves her life. When the pack of bad shifters comes to cause drama they have no choice to take it up a notch because of the things their leader has done. I like the way it ended because I'm a sucker for fated mates or lust at first sight type of stories especially when it involves shifters who can usually tell right away who their true mates are. My only problem with this story is that it felt a little rushed but I did enjoy the story quite a bit. I give this 3 out of 5 stars.